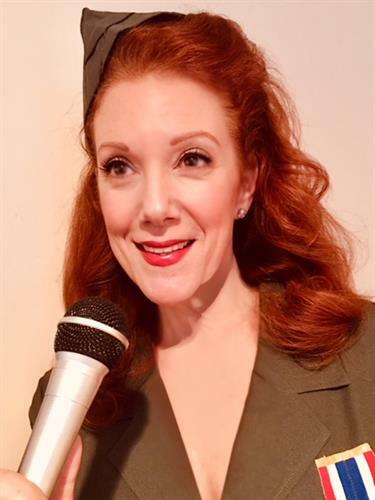 Patricia Durante sings the iconic songs of WWII such as “We’ll Meet Again, “Don’t Sit Under the Apple Tree,” “The White Cliffs of Dover,” “This is the Army, Mr. Jones,” - and many more! Throughout the show, she engages with the audience, and puts the songs in their historical context. Printed song lyrics are provided for “sing-alongs!” We may even find the much-needed third female to complete our Andrews Sisters Trio in the audience! Meet Patricia and her accompanist after the hour-long show at a reception at The Chalfonte. Patricia Durante graduated from the American Music and Dramatic Academy, and studied at HB Studios - both in NYC. She also studied at Shakespeare’s Globe Theatre in London, UK. She is the 2015 Winner of “NJ Best Actress in a Musical” for her portrayal of Patsy Cline in the Women’s Theater Company’s (Parsippany, NJ) production of Always Patsy Cline. Other awards: “DC Metro/Arts”’ “2015 Philadelphia’s Best Individual Performances in Theatre” for her portrayal of the Queen in Ionesco’s Exit the King, produced by Philadelphia’s IRC at Walnut Street Theatre; 2014 WCA Milwaukee’s “Outstanding Dramatic Performance” for her portrayal of Corrynn in Gidion’s Knot, at Boulevard Theatre, 2011 “Best Lead Actress in a Play” for Enchanted April, also at Women’s Theater Company. Her solo CD, Just Some Favorites is available on iTunes and cdbaby.com.